The perfect kit for all vehicles - compact and easy to refill. This 91-piece Car/Vehicle First Aid Kit is designed for fleet and commercial vehicles, cars, trucks & SUV's. Its strong metal case with gasket holds quality brand products that are easily accessible in an emergency. 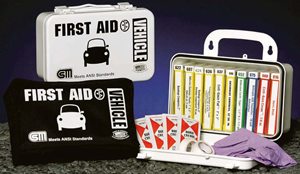 This Car/Auto First Aid Kit meets federal OSHA recommendations and offers easy refilling with the help of a full-color reordering schematic. 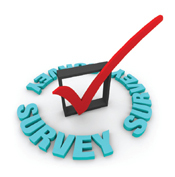 Refills are color-coded and shrink-wrapped for safety and ease of identification. 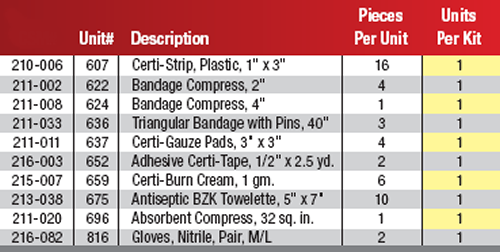 Car/Auto First Aid Kit Dimensions: 6-5/16"x9-1/16"x2-3/8"
Vehicle kit, 91 piece bulk kit, plastic case w/ gasket, 1 ea. This 91-piece vehicle kit is designed for fleet and commercial vehicles. Its polypropylene case with gasket holds quality brand products that are easily accessible in an emergency. This kit meets federal OSHA recommendations and offers easy refilling with the help of a full-color reordering schematic. Refills are color-coded for ease of identification. (1) M-701-NIA: Eye wash, 4 oz. Tuck this Car/Auto First Aid Kit beside the driver's seat and relax, knowing you're prepared for any roadside emergency. With a wide assortment of first aid essentials and travel safety items, this Car/Auto First Aid Kit is a must-have for every car, truck, or SUV on the road. Car/Auto First Aid Kit Dimensions: 7-5/16"x5-1/4"x2-1/4"
This Car/Auto First Aid Kit prepares you for those minor injuries common in the home. Treat a wide variety of cuts, scrapes, scratches and abrasions while fighting infection and the pain associated with them. With a wide assortment of first aid essentials and travel safety items, this Car/Auto First Aid Kit is a must-have for every car, truck, or SUV on the road.